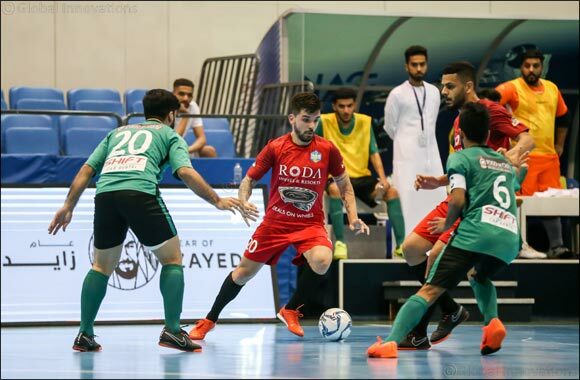 Dubai, UAE, June 4, 2018: Defending champions Al Taher put in a consummate team performance on Sunday night, fighting back from a goal down to beat fancied Fuhood Zaabeel 2-1 and book their place in the last four of the 2018 Nad Al Sheba Futsal Championship. Led by their diminutive Iranian captain Ali Asghar Hassanzadeh, a three-time AFC Futsal Player of the Year, Al Taher bounced back after Tariq Abdulla Al Ali had put Fuhood Zaabeel ahead in the 3rd minute, with Brazilian Jefferson Luis Carpes equalising in the 8th minute before Ahmad Abdullah gave them the lead four minutes later. Al Taher then kept Fuhood’s marauding Brazilian trio of Mateus Da Silva, Taynan Da Silva and Douglas Junior at bay to protect their lead and set up a semi-final clash with Emirates Driving Institute, who crushed The Storm 9-2 in the other quarterfinal of the night. “I think we showed great discipline and resolve to hold off one of the most dangerous attacking trio in futsal,” said Hassanzadeh. “So we are really pleased with this win. “I guess the loss in the opening game against Al Bahri has served as a wake-up call for the team. We have shown a lot more focus and commitment since, never letting our guard down, and now we are determined to keep this momentum going. The Storm, meanwhile, arrived with only six players for their quarterfinal against Emirates Driving. Brazilian Leonardo Mendonca Da Rosa was the lone foreign player on the list, but he received a direct red in the 12th minute to further increase his team’s woes. Having drubbed The Emperor 16-1 in their last match, Emirates Driving took full advantage of the situation. with Williams Oliver Do Nascimento scoring a brace to move to the top of the tournament’s scoring charts with eight goals. Thiago Teles Martins and Mohammed Abdulla Salem also scored two goals each, while Rangel Taian Pereira, Sabry Jameel and Jaber Shah scored one apiece. Dubai Municipality will take on Dubai Public Prosecution in the final of the NAS Wheelchair Basketball Championship, after defeating Dubai Police and Dubai Corporation for Ambulance Services respectively in the semis. Dubai Municipality beat Dubai Police 41-19 in the first semi-final at the Dubai Club for the People of Determination, while Dubai Public Prosecution cruised to a 59-22 win in the other semis. “We played a big game against a very strong opponent,” said Mohammed Al Zarooni, a member of the Dubai Municipality team. “Everyone knows that the Dubai Police have the Egyptian Ashraf Abu Zeid in their squad and he has participated in this tournament several times. “But our strategy was to mark them closely and not allow them the space to play their game, especially Ashraf Abu Zaid, and we succeeded in doing that. Javier Lopez and Sandy Farquharson defeated Xavier Masson and Benjamin Cassaigne 6-2, 6-3 to retain their Open division title in the NAS Padel Tennis Championship, while Emilio Misas and Carlos Luna edged Mohammed Al Mansouri and Guillermo Villafane 5-7, 6-4, 6-2 in the playoff for third place. Organised by Dubai Sports Council (DSC) under the patronage of His Highness Sheikh Hamdan Bin Mohammed Bin Rashid Al Maktoum, Crown Prince of Dubai and Chairman of Dubai Sports Council, the 2018 Nad Al Sheba Sports Tournament will see more than 5,000 athletes compete for a total prize-purse of Dh6 million in Dubai, across 11 competitions. Futsal (Quarterfinals): Emirates Driving Institute beat The Storm 9-2; Al Taher beat Fuhood Zaabeel 2-1. Wheelchair Basketball (Semi-final): Dubai Municipality beat Dubai Police 41-19; Dubai Public Prosecution beat Dubai Corporation for Ambulance Services 59-22. Padel (Open Category): Final - Javier Lopez and Sandy Farquharson beat Xavier Masson and Benjamin Cassaigne 2-0 (6-2, 6-3); Third-Place: Emilio Misas and Carlos Luna beat Mohammed Al Mansouri and Guillermo Villafane 2-1 (5-7, 6-4, 6-2). Futsal1: Emirates Driving Institute’s Sabry Jameel (No8) scores in their 9-2 rout of The Storm in a quarterfinal match of the NAS Futsal Championship.